Drawing on a twenty-four-year friendship with Crutcher -- the two met as undergraduates at Eastern Washington State College - Davis provides readers with a superbly crafted entree to the writer and his work, the first biocritical study devoted to Crutcher. In a cogent style, Davis delineates the people and events shaping Crutcher's character and commitment to youth and examines each of the published works, including Crutcher's 1992 novel for adults, The Deep End. While assessing each work's plot, theme, ethical perspectives, and critical reception, Davis draws freely on a wealth of personal observations from Crutcher and on insights Davis himself has gained during their long association. Readers learn, for example, that Crutcher can do one hundred straight push-ups; that his outlook was sharply influenced by his maternal grandfather, who grew up an orphan; and that at Christmastime Crutcher asks friends to give him not gifts but money he can use to help his clients at one of Spokane's mental health centers. Throughout, Davis employs engaging literary techniques to make his subject come alive for readers - taking readers on an imaginary motorcycle ride to visit the Idaho of Crutcher's youth, for instance, and introducing readers to Crutcher's mother, Jewell, who offers wry and telling remarks about her son. A portrait of a writer who infuses his work with physical, emotional, and intellectual energy, Presenting Chris Crutcher will appeal to young people, librarians, teachers of English and reading, and college and graduate students of adolescent literature. Everyone loves Chris Crutcher. His readers, his adolescent clients, his colleagues, his friends, and the selectors for any number of best books lists for teenagers. Now, thanks to Davis, we know why. In this work, part of Twayne's Young Adult Authors series, Davis draws on interviews, reviews, his own supply of observations and anecdotes (acquired during his lifelong friendship with Crutcher), and passages from Crutcher's rich body of work to explain Crutcher's extraordinary sensitivity and devotion to adolescents, as reflected in his dual professional roles as therapist and author. Davis's insights illuminate the complexity of Crutcher's philosophy, the foundation of which is a deep and abiding understanding of and respect for adolescents and their courage in the face of all the challenges they master on their way to adulthood. Davis also spends a considerable amount of time discussing one of Crutcher's literary strengths, rarely found in typical YA novels, and that is his consistent portrayal of decent supportive adults in the lives of his protagonists, which endears him to readers of all ages. Davis pulls together the influences of Crutcher's life to give the reader a grasp of Crutcher's clear hard honesty that is a sustaining theme in his novels and short stories. Fascinating reading. Old fans will rush to the shelf to re-read his oeuvre. Those unfamiliar with Crutcher magic will go on a binge. Index. Biblio. Source Notes. The author discusses the life of Crutcher and assesses his fiction for young adults in terms of plot, theme, ethical perspectives, and critical reception. He also discusses Crutcher's novel for adults, The Deep End, and his friendship with the novelist. The works discussed include Athletic Shorts, Chinese Handcuffs, The Deep End, Ironman, The Crazy Horse Electric Game, Running Loose, Staying Fat for Sarah Byrnes, and Stotan! Annotation c. by Book News, Inc., Portland, Or. One of the great pleasures in editing the Twayne series was matching subject authors with congenial writers. Joanne Brown and Kathryn Lasky, two witty Jewish mothers, hit it off beautifully, as did passionate shoppers Paula Danziger and Kathleen Krull. Ted Hipple charmed me into giving him a contract to write about his fellow Tennessee author, Sue Ellen Bridgers. But perhaps my best match was Terry Davis with his college friend Chris Crutcher. Terry, as a fine YA author himself, wrote a brilliant biographical chapter in the shape of a long, fictional motorcycle journey, which I very reluctantly axed because it didn’t fit the rest of the book, but his intimate knowledge of the dynamics of Crutch’s family provided invaluable insights into the author’s work. Describes the history of the Houston Comets professional women's basketball team and profiles some of their leading players. Highlights some of the important personalities and key moments in football played at the University of Alabama. What is a typical guy moment, anyhow? Daniel Pinkwater remembers the disappointment of meeting his Lone Star Ranger hero up close and personal. Gordon Korman relishes the goofy ultra violence of the old Looney Tunes cartoons. Stephen King realizes that having your two hundred- pound babysitter fart on your five-year-old head prepares you for any literary criticism. 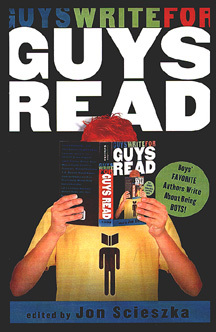 And that's just a sampling from Guys Write for Guys Read, a fast-paced, high energy collection of short works: stories, essays, columns, cartoons, anecdotes, and artwork by today's most popular writers and illustrators. Guys Write will feature work from Brian Jacques, Jerry Spinelli, Chris Crutcher, Mo Willems, Chris Van Allsburg, Matt Groening, Neil Gaiman, the editors and columnists from Sports Illustrated, The Onion and Esquire magazines, and more. Selected by voters at the Guys Read Web site and compiled by Jon Scieszka, this wide-ranging collection of authors and illustrators shows that guys do read . . . and will read more if given things they enjoy reading. On a cold day in February, a stranger arrives in the village of Iping. He wears gloves and dark glasses, even inside, and his face is covered in bandages. 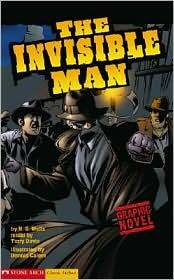 Soon crimes occur that cannot be explained, and the townspeople realize the unthinkable truth: the strange man is invisible--and he is slowly going mad.The Invisible Man is a dangerous enemy who must be stopped. But if no one can see him, how can he be caught? A classic retold in graphic novel form by Terry Davis. Two of Wells's sf masterpieces get the red carpet treatment here. These "critical text" editions contain the full text plus annotations, indexes, appendixes, and bibliographies. Though these editions are pricey, Wells's works deserve serious consideration. Libraries should at least stock up on a few extra budget paperback copies of Doctor Moreau to meet demand generated by a forthcoming film remake starring Marlon Brando and Val Kilmer. Wells's simple stories are surefire hits. Is time travel possible? What would it be like to be invisible? 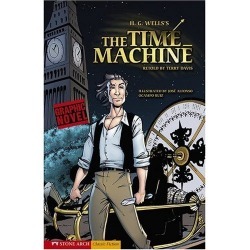 These slim versions of the classics provide both the mind-bending plots-although slightly edited, such as a twist ending in The Time Machine -and also some discussion questions and writing prompts. The artwork and paneling are slightly oversize, hinting at a younger audience, but the coloring and lettering have that familiar computer-enhanced sleekness comic readers know well by now. Because of the simplified texts and the slimness of the volumes, these titles are great choices for boosting the reading interests and skills of reluctant readers.-John Leighton, Brooklyn Public Library, NY Copyright 2008 Reed Business Information.